When NAS A’s new Space Launch System (SLS) launches on its first flight, it will be doing some serious multi-tasking. Not only will Exploration Mission-1 test the performance of SLS and its integration with the Orion spacecraft – the agency plans to use its massive lift capability to carry nearly a dozen nano-satellites to conduct science experiments beyond low Earth orbit. NASA’s newest rocket will launch Orion on an uncrewed test flight to a distant retrograde orbit around the moon. Tucked inside the stage adapter — the ring connecting Orion to the top propulsion stage of the SLS — will be 11 self-contained small satellites, each about the size of a large shoebox. About 10 minutes after Orion and its service module escape the pull of Earth’s gravity, the two will disconnect and Orion will proceed toward the moon. Once Orion is a safe distance away, the small payloads will begin to be deployed, all at various times during the flight depending on the particular missions. In other deep space news, NASA announced on March 30 a series of new partnerships with U.S. industry for key deep space capabilities. The agency selected 12 Next Space Technologies for Exploration Partnerships (NextSTEP) to advance concept studies and technology development projects in the areas of advanced propulsion, habitation and small satellites. 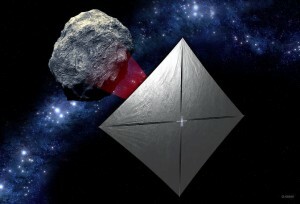 Through these public-private partnerships, selected companies will partner with NASA to develop the exploration capabilities necessary to enable commercial endeavors in space and human exploration to deep space destinations such as the proving ground of space around the moon, known as cis-lunar space, and Mars.